McConnell Air Force Base held the fifth KC-46 Pegasus Maintenance Training Summit to inform the aircraft’s maintainers, crews and other involved personnel on expected training schedules and requirements. 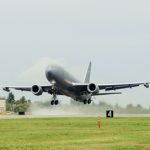 The summit generally aimed to address the KC-46’s training requirements in preparation for the aerial refueling aircraft’s expected arrival in October, the U.S. Air Force said Friday. The event also provided a discussion on the service branch’s approach to cross-train maintainers of the KC-135 Stratotanker to the newer KC-46. Master Sgt. Ian Evans, 22nd MXG KC-46 transition team superintendent, said the 22nd Maintenance Group developed the KC-46’s training timeline that the Air Mobility Command will progressively adopt. “After we implement the aircraft and go through the initial phases of training, we’re going to readjust our training and technical school curriculum,” he added. The summit will reconvene to revisit and refine the KC-46 master training plan, two months after the aircraft’s delivery.